Combining the style of a wristwatch with the functionality of an activity tracker, the stainless steel Vivomove tracks steps, monitors sleep and syncs with the Garmin Connect mobile app to let you view full stats. And with a 1 year battery life, you'll never need to charge it. Finished with a black dial and interchangeable brown leather strap. 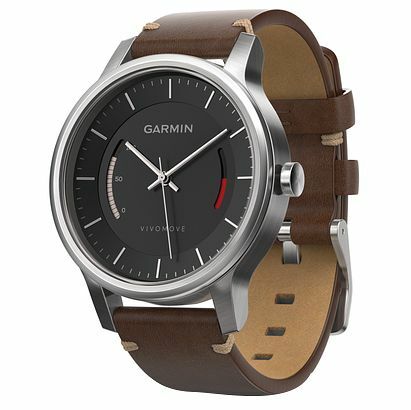 Garmin Vivomove Premium Brown Strap Activity Tracker is rated 5.0 out of 5 by 1.